Thanks to a unique design/build partnership, our Electric Utility Design team is helping ensure customers in rural Texas communities have access to clean energy. 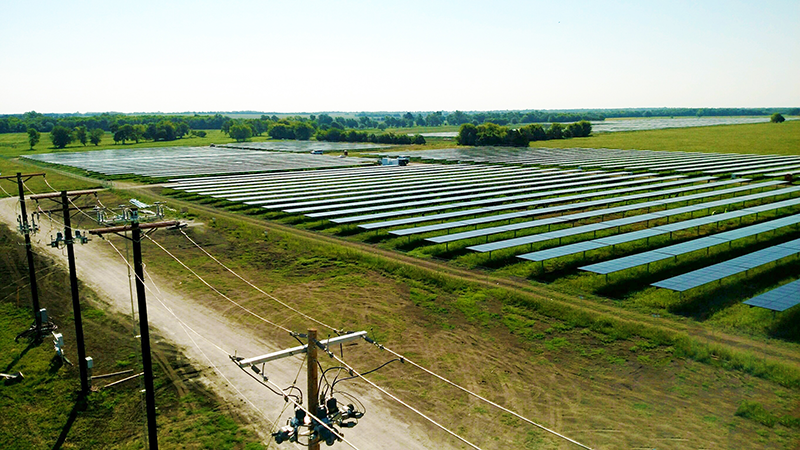 We recently partnered with ElectriComm, Inc. on three utility-scale solar farms in east and central Texas. Under our agreement, we provided engineering design services while ElectriComm performed the field construction services. MKEC’s role was to safeguard power delivery to customers. We needed to make sure that, in the event of a system fault – caused by a lightning strike or animal interference, for example – our solution protects the interconnection between each new solar farm and its utility grid while limiting the loss of electricity to as few customers as possible. To accomplish this, we studied the service provider’s power system and developed device settings that would provide both equipment protection and high levels of reliability to customers. Much like how a water line’s shutoff valves allow for isolating a leak without disrupting flow elsewhere, if a circuit or substation encounters a problem, substation and line protective devices work together to detect and automatically isolate the problem, minimizing disruption of power to the smallest part of the circuit possible. Not only does this mean that the fewest possible customers are impacted, but also the power system infrastructure is protected as a whole. Our partners at ElectriComm then took our engineering design from the drawing board and implemented in the field, programming field devices with the intelligence to perform their intended functions. Through this collaborative effort with ElectriComm, we helped deliver locally-sourced, cost-effective solar power solutions to these communities, and we believe this project demonstrates the value a successful design/build partnership brings to clients. We are proud to continue to play a role in the thriving clean energy market.